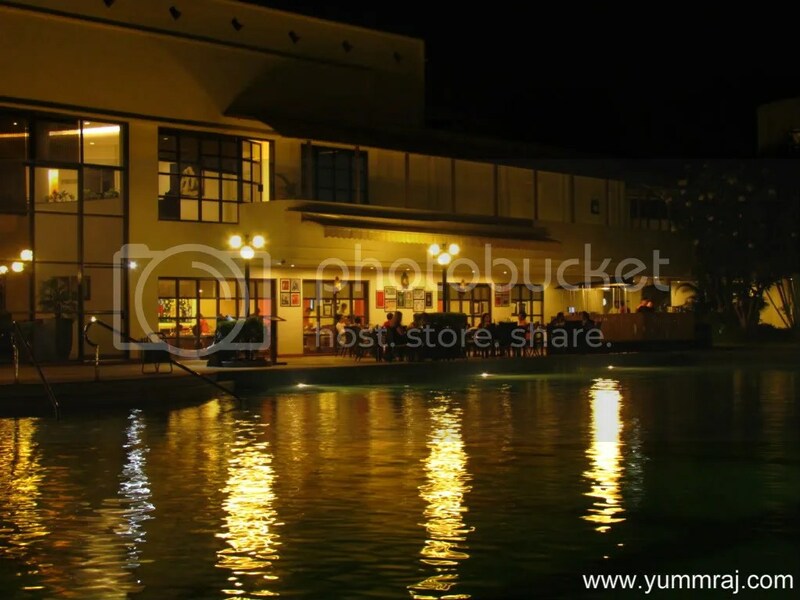 Though we have stayed in Gurgaon for many years now, we have not been to the Gurgaon or Delhi Lemon Tree Hotels. Our first brush with Lemon tree was at Aurangabad & this is where we saw a board that mentioned ‘winner of Times Food Guide Best Asian Food’ award. I was surprised. Times Food Guide in Aurangabad?? Checked with the Hotel Lobby & then came the story – The Delhi chapter had won the Times Food guide award twice. Since the menu & recipe is same across all the Republic of Noodles restaurants, they had put up such an advertisement. Nonetheless we decided to give it a try & we were not at all dissappointed. Infact we loved the experience at this place. 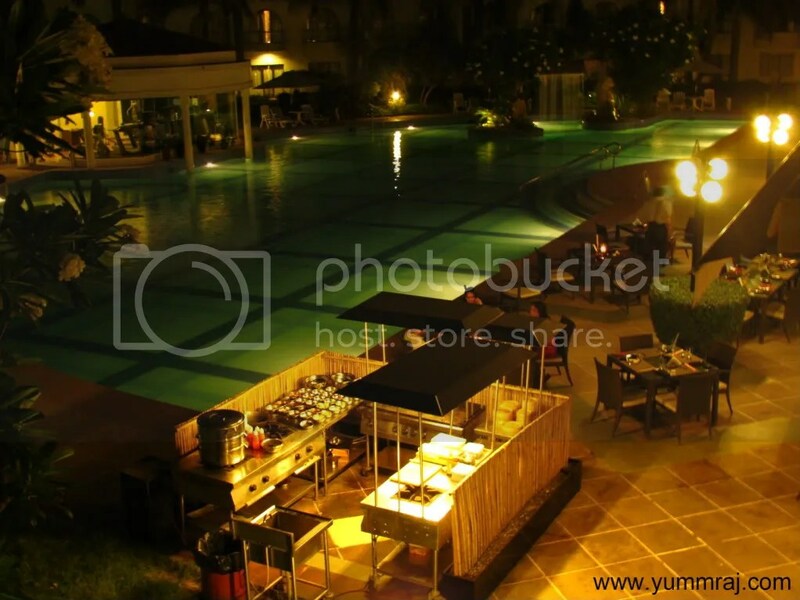 The Restaurant at the Aurangabad property is pool-side. So the ambience was very good. Though there is a little bit of electric lighting in the corner, the real light for the dining table is just a candle – So even without planning for a ‘candlelight dinner’ u inadvertently end up in one. The kitchen was an open kitchen on the poolside. One can go & take a peek at whats cooking. The service was reasonably on time & the guys serving were quite warm & knowledgeable. We went for the dishes which showed up as Chef’s recommendation in the menu card. Loved the food. Honestly it was much better than my expectations. I cannot vouch that the dishes were 100% authentic but they were really good to taste. 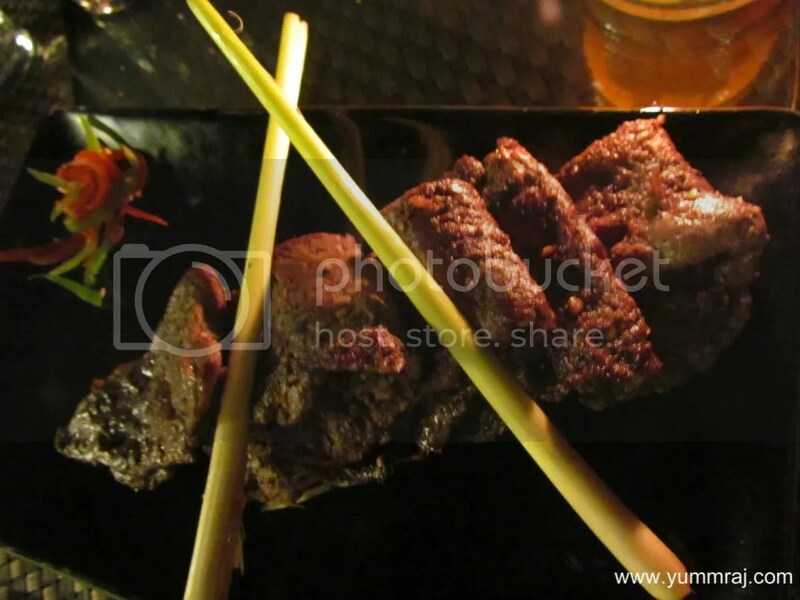 Our first order was a starter – Asian Style Grilled Beef tenderloin. This was five different strips of tenderloin marinated with with Asian sauces, grilled & served with Vietnamese lemongrass dressing. Since meats outside of India are never melt in the mouth like the ones in Lucknowi Dum cooking, it is unfair to expect a tenderloin to be that soft. However, by its own standards the meat was well cooked, soft & juicy. Flavors of the lemongrass added magic.Very good & different to taste – different from the European & also the Chinese versions that we are otherwise used to. A truly tasty & enjoyable dish. Our second order was Banana Leaf fish. A minute after accepting the order, the gentleman waiting on us returned – ‘Sir, we did not receive stock of Banana leaf today. So if u wish, u can try it without the banana leaf. Chef said that will not be bad either’. Seeing that we were a bit concerned, came another line ‘Sir, it is the same fish, same marination, same cooking procedure only the wrapping in banana leaf will not happen’. With the thought that at most we wud miss the banana leaf flavor, we accepted the offer to have ‘Banana Leaf fish’ sans the banana leaf!!!! ……………. & we did not regret. It was really really good. In fact this turned out to be the best dish of the evening. It turned out to be Fish marinated with Balinese spices wrapped in I guess a foil (in absence of Banana leaf) & grilled. 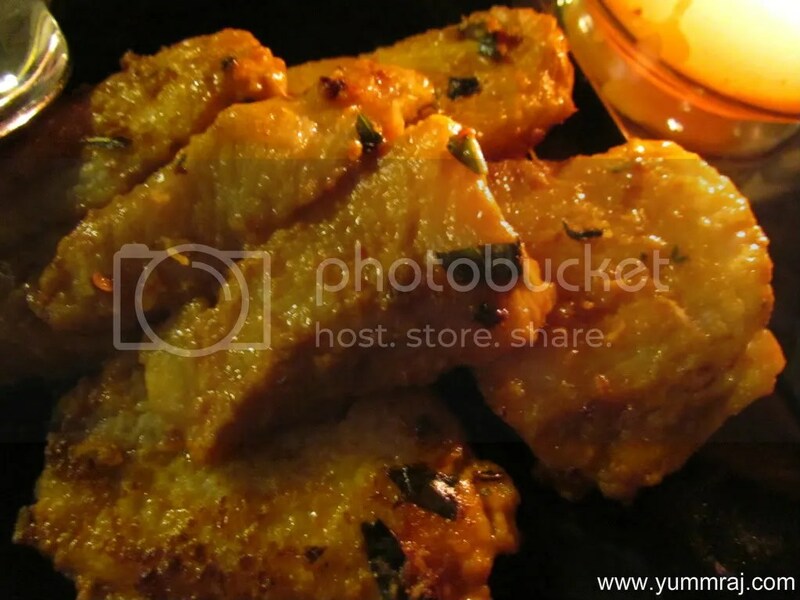 The result was Flaky, soft, juicy, very tasty, & very flavorful chunks of fish. The tastebuds went mad with joy with every bite as all the juices flowed in together. 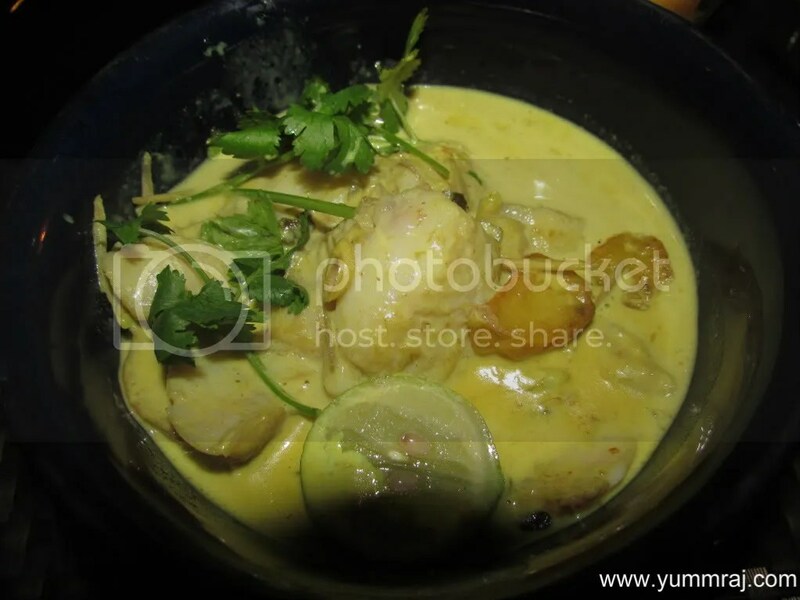 For main course we tried Burmese curry with lime & potatoes – It was fish in a thick coconut milk based curry with strong flavors. It had a very good & interesting taste. We had this with steamed rice. Next we had Northern Thai Khao Soi – It was Chiang Mai Curried noodles with assortment of condiments. This was different in taste.than the Burmese Khao Suey that we have been eating so far. The noodles were thicker & the gravy was very very thick to the extent that u cud not separate the gravy from the noodles. 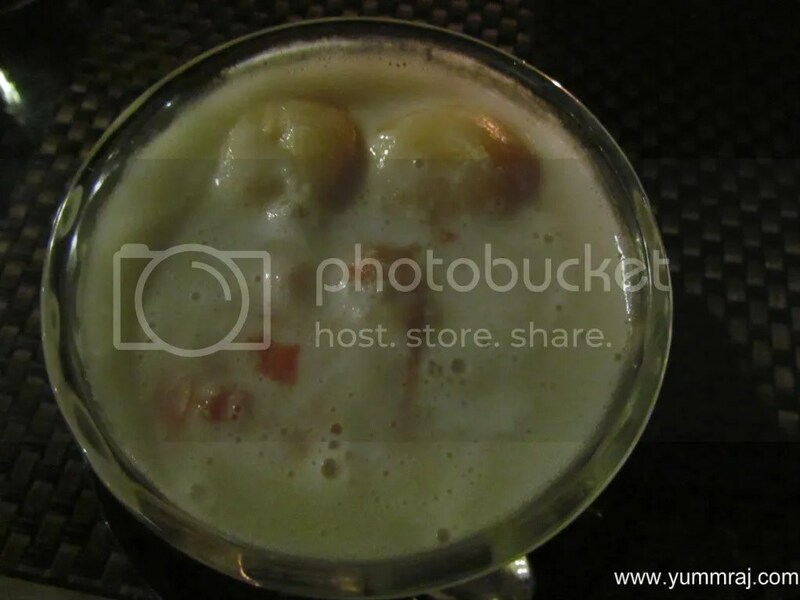 The dish had the consistency of a thick vermicelli payasam in which no water has been added while cooking. The number of condiments in Thai Khao Soi was much lesser than that in Burmese kitchen. 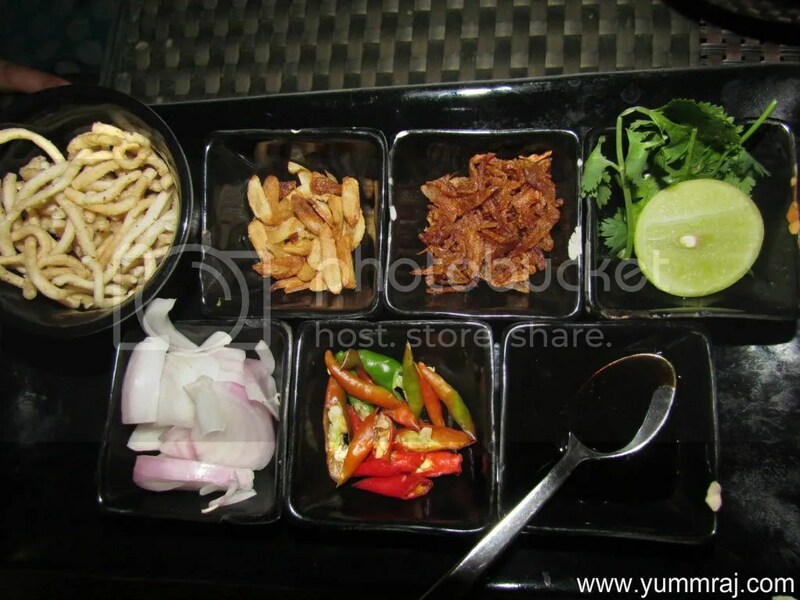 The garlic pieces were smaller in sizes, crispy fried onions were similar & so were the green chilli slices. All the condiments made their presence felt & every bite wud taste different from the previous one due to the random mix of condiments. However what was new was a very thick dark brown soyabean based sauce that looked like molten chocolate. This Soy sauce made the dish taste very different than the burmese version. 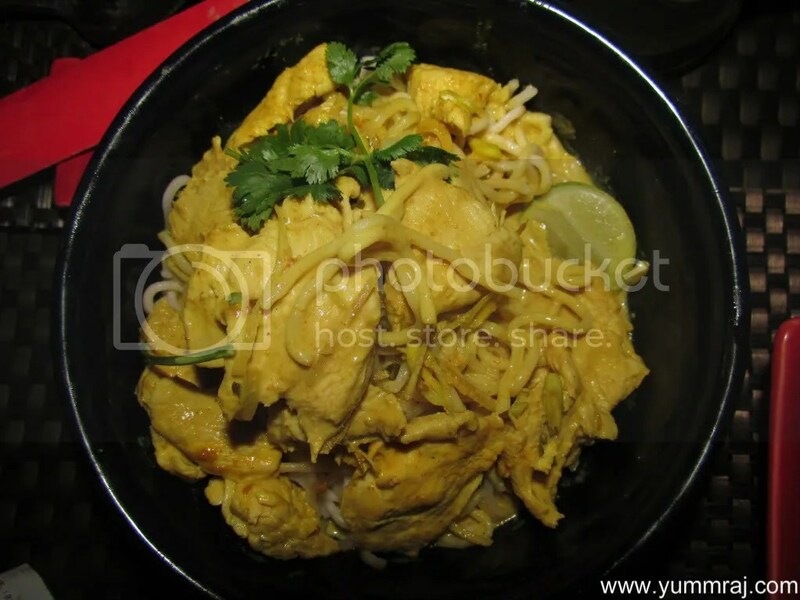 We had the Khao soi with chicken. Overall, very different & new than all the khao sueys I have ever had. For dessert we tried the Fried ice cream. The one served here was vanilla ice cream coated with corn flakes & deep fried. This was served with caramel sauce. The taste of this dish was better in Royal China Delhi & also in Dimsum Bros Gurgaon – but it was quite good on its own. 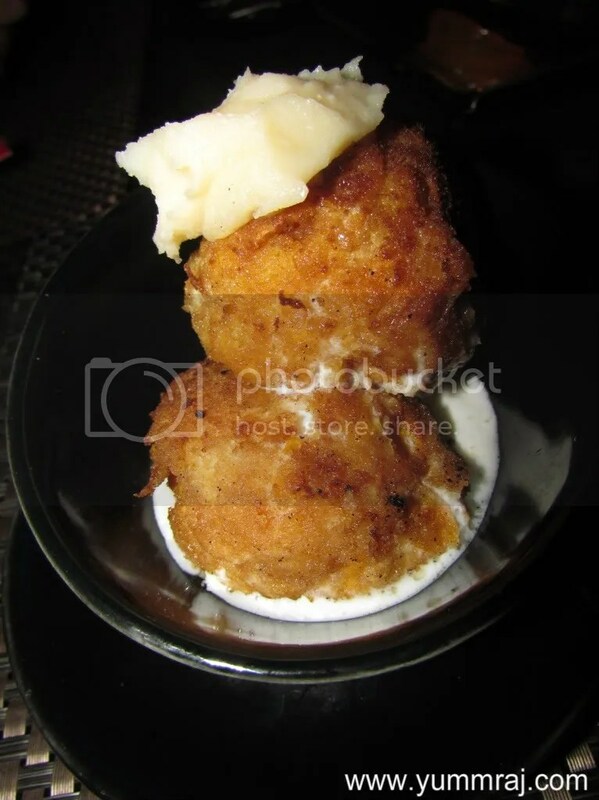 The cool twist that the guys here at Lemon Tree added was a dollop of slightly salted but sweet cream on top of the fried ice cream balls. Water chestnut rubies in coconut milk was super good. In fact, Wow. The coconut milk sauce was super thick, perfectly sweet & it had soft waterchestnuts & de-seeded lichi in it. We had this dessert till the last drop. Loved it. Obviously this was quite a heavy dessert. We washed all this down with some real good Mojito. Perfect in every sense. 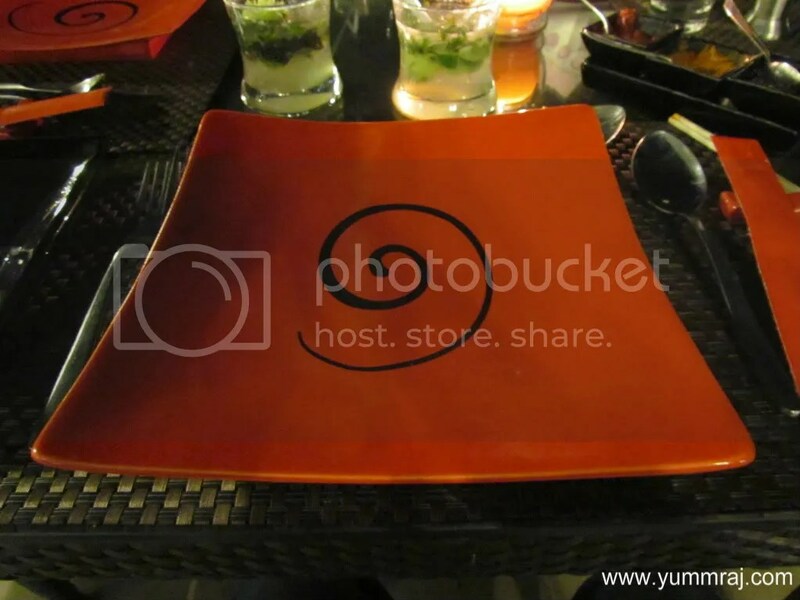 Overall – not very many restaurants can pull this off – all dishes in one dinner were very good. Look forward to visting other lemon tree hotels in Delhi NCR as I am not sure how many more times I will visit Aurangabad again.